High output compressor with cast iron pump, Big Bore™ cylinder and piston, combined with greater bore and stroke, delivers maximum performance. Brad nailer uses standard 18-gauge brads from 5/8in. to 2in. Makita MAC700. Not good if you need to move it around a lot. I purchased this some 4 years ago and would not buy it again. I decided to go with this Makita because of good reviews at the time and b/c of the fact that it was oil lubricated, had a cast iron cylinder and is quieter than oil less units. The unit is built solid and is rather quiet, but could be quieter as the cooling fin sleeve around the pressure line is always rattling when the unit is running. Now what bothers me the most is the weight. I am a big guy and get annoyed by the weight. If you have to lug this from job site to job site and lift it onto the bed of your truck, DON'T GET THIS UNIT! It's just too heavy for what it does. There are much lighter and cheaper units out there that do the same job and are not much noisier(Senco). The other thing that really bothers me is the high center of gravity this unit has. It needs to be tied down tight on your truck bed or in your car or it will topple over in the first curve which I don't like b/c of the oil in the unit,(i.e.you can't just lay it down, either) plus it can easily break this way, due to parts (gauges, pressure lines) sticking out, and scratching everything it hits. Simple bungees will not do! You need to use ratchet straps, or arrange other, heavier items around it. I use this for nailing primarily, and it works fine for that purpose. But I also bought it to blow things clean. If you are thinking you will use it for that purpose mostly, don't get this unit. The tank is just too small, and the unit loses pressure so fast that you will wait for the unit to recover more than you will clean. It blows at full pressure for about 1 second and it takes only about another few seconds until pressure becomes useless. This however may be the case with all units that have a small tank like this one. If I had to purchase another unit today, I would consider a pancake design or parallel(not stacked)twin tank design. Watch for oil less designs, as they are much, much louder than this unit is. I read the reviews and was convince that the MAC700 was the compressor for me, I also read the common complaints about the frequent shipping damage, I live in Hawaii, 6000 mile trip from the sales source. I figured it would get a little banged around but bought it anyway. It came today and the box was in perfect condition, Atta boy to FedEx! But when I opened it up I could see that the motor cover was busted in several places, the motor fan was bent and a cut was in the metal leg. There is no way this unit got damaged in shipping, this unit must have been dropped at the factory and put into the box damaged? I contacted Amazon and the service rep told me to send it back for a replacement, or I could buy the replacement parts from the Makita Service center and Amazon would credit me for the cost. I will do a follow up later and let the readers of this review know of my success or failure with Makita and Amazon, until then buyers beware. 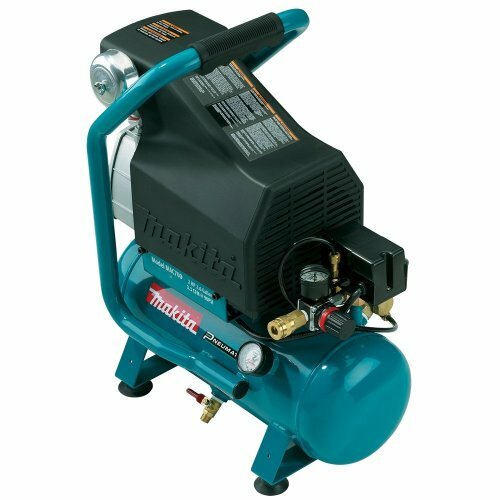 I got the parts, replaced them and the unit runs fine, I use the compressor with a framing nailer and it works great, and the unit can be rebuild without sending it off when the time comes, all the parts can be order from Makita. I am glad I bought the compressor and recommend the unit to those need a real quiet work horse. Great portability, adequate to run a Porter-Cable framing nailer at a d-i-y'er rate, and wonderfully quiet. Pressure is easy to adjust and holds its setting perfectly. I am completely satisfied and rarely give a product 5 stars. This Makita has earned it. Perfect for the single man crew. I love this little compressor. I have been using this compressor for about three years now (built a new home and lots of weekend/evening side work) and can tell you it is a solid and VERY quiet performer. I originally looked at all the compressors available at the time, looking for a compressor that was oil lubricated, light weight, low amp draw and high quality. I have owned two other compressors and sold compressors for five years at a good local tool supplier, so I had a very good idea of what I wanted. The Makita tool line is always high quality if not the very best designed, they are among the best. After shopping the local stores and browsing the internet I decided the combination of lower RPM (hence the low noise) and low amp draw (I have yet to trip a breaker in anyone's home)would make this Makita a good choice. The compressor is very well made, from the castings to the paint to the filter this tool has great fit and finish. It is a breeze to pick up and put in the pickup and carry into someones home (you can actually have it in someones home while your working, just watch the rubber feet, they mark up the floors). I have never run out of air using one tool at a time be it a framer, siding gun, flooring or finish gun. So the question is why only four stars for the answer to my compressor needs? My Makita was damaged in the packaging and thus required a minor tweak to the air switch to get it to cycle. Two years later I ordered one for my brother (Mine was always on loan to him when I needed it) and this one was also damaged inside the packaging, the plastic housing was smashed to bits. In both cases there was no visible damage to the packaging. I was going to purchase one of these, but every time I come back to it, it gets more expensive. They have jacked the price up from about $160 to now $250, I'm not sure how they justify this. Anyone else notice this? It is very rare indeed that I buy anything that is not defective, no matter how much the item cost. This was more so a consideration for me when I read all the problems customers had after receiving their Amazon shipped MAC 700. This was an exception! I've owned quite a few Makita power tools, and have not had any issue with any of those until my impact driver batteries started going bad two years ago. I just replaced that with a Hitachi Micro from Amazon recently, and I am very pleased so far with that purchase. That is the only Makita tool I have ever replaced. Had there been a source of reliable new stock batteries for it, I would have had no reason to replace that tool either. Due to my exceptional track record owning Makita products and the excellent service with Amazon, I opted to settle on a "middle of the road" sized compressor. Having a very bad back, anything larger/heavier was simply out of the question. I could not deal with another noisy pancake compressor. I received the MAC 700 yesterday. WOW! I was astounded to unpack the compressor and not find one problem with it. This is the only compressor I have ever owned that used oil. My contracting days are way behind me and prior to this I have only owned a Sears Industrial pancake 1.5HP, 4 gal compressor. It served my needs for over 15 years and I felt it was beginning to strain when topping off the tank lately. Since I keep the compressor in the kitchen (no garage and way too heavy to lug up and down the basement),I NEEDED a quieter compressor. This MAC 700 is it! The Makita is SO quiet compared to the Sears pancake you have to hear it to appreciate the difference. I did not run into any of the reported issues with the tag wire going into the crankcase, no broken or missing parts, or anything else previous buyers have had an issue with. It takes just over one minute to fill the tank. It is only slightly smaller than the Sears 4 gal, but not much lighter, if at all. Nonetheless, this is a very nice unit. My only concern would be the drain valve is way too close to the ground for potential, accidental damage. I would have liked to have seen the drain valve (best I have ever seen) placed elsewhere on the tank or designed a little differently. I have no intention of using it for the same reasons I had bought the larger tank Sears unit when I was contracting, or used for painting large projects. This was bought for the occasional tire inflation, vacuum cleaner bag and A/C filter cleaning etc. I keep this on a dolly for easy transport anywhere in the house, and the carpeted dolly helps reduce the noise as well. I also bought the 135 PSI, 5 gal Sears Air Tank ($24) and installed QD fittings ($15) so all my compressor accessories would fit both the compressor and the air tank, eliminating the need to carry the compressor in the basement for small jobs such as blowing out the drain line on the dehumidifier. Another very satisfied purchase from Amazon! Very quiet, can run in my basement wood shop without earplugs. Small enough to keep under a bench, and recycles quick enough for my uses. I have other Makita products and all seem to be well built and have lasted under heavy use. Quite pleased with my purchase. It looks good also. A friend asked, sarcastically, if I waxed it. Great compressor. Does more than fill tires. I was not sure about this based on the reviews. I was looking for a unit that would operate a framing nailer. I am not a contractor and only need it from time to time on home remodel projects. So far I have had no trouble nailing off 1/2" sheething with 10d nails. This is at 70lbs pressure which is the recomended pressure for the Hitachi gun I got. When I went up to 16d nails I was forced to raise the pressure up to 80lbs but then no problem and I can get through half to 3/4's of a nail rack before the generator starts up again. Nails drive flush even into older doug fir (which is harder than green). Unit is heavyish, but not awkward to carry. Instructions were not helpful and seemed to assume some prior knowledge of air compressors but YouTube tutorials helped out there so no big deal. Would recommend this to home owner who needed to operate a framing nailer on small jobs or contractor who works alone and is not framing a house. This was my first compressor so I have no comparison but over all I am pleased. The plastic housing that everyone says came broken did not come broken. I have owned this tool for about three years now and am quite happy with the sound level, size and performance. As with anything there are trade-offs with it's compact size and air capacity. I do allot of woodworking so this is my stapler and brad nail partner. It cycles less than you would think, but if you have to clean off shelving or a project where you just spray continously you'll see that the small tank can't keep up too well. But as I said, I can put this in the truck or carry it into a home and most of all it's QUIET. I read all of these specs and when the manufacturer says it operates at a certain decibel level, it better not sound like a jet engine! Bottom line, I like Makita and I like this compressor. No shipping problems, But I live in Ohio which is close to the Kentucky warehouse. Unit seems fine, but rather heavy as many have reported. Hopefully, it will last. I like MAkitta as a brand name. I have tried different Makitta tools and I never had a problem . I have no problem with this air compressor also but I think I was wrong about the tank size. 2.6 is nothing if you want to use this compressor for cleaning or painting jobs. it dores not give you enough air. The air comes out strong and to the point but not enough to last with the same force for more than five minutes then it gets weaker and weaker! The compressor has almost no noise. Quite, stable, well built. Remember to buy all the accessories to enjoy it cos' the comp comes with nothing! Also remember to attatch the metal part(filter) to the side of the compressor. Nothing was mentioned in the manual about the filter or how to attach it to the comp. Good luck. great little compressor, exceded my expectations. Put the Mac700 to the test with a 15guage porter cable finish nail gun. Now a 15g gun wont use the cfm a frameing nailer does but it uses a lot more than a brad nailer will. I shot 10 2" nails in a 2x4 before the compressor kicked on, kept going to something like 20 rapid fire shots and the mac700 kept up. I would think it would hold its own even with framing nailer. This was more than I expected. It recovers quickly and you can hardly hear it running with ear plugs in. Should have had one years ago, great little rig. Mine came undamaged, and in 2 days. The Makita it's self is great. My complaint is with the broken upload valve on arrival. The unit was packaged well and no damage to the box in shipment. This means the valve was broke when placed into the box. They did send a replacement but still with the unit being dead on arrival leaves a poor impression. Once running it does the job. Worked out of the box, no adjusting, no tightening loose air fittings. Handle makes it easy to carry and has a great profile for storage. Would recommend to anyone looking for an air compressor of this size.